As one of the prominent disc media for movies and TV shows, DVD still takes up the dominant position in optical disc storage medium due to its cheaper price and wide availability (almost every movies ever made is available in DVD format). However, it’s a great pity that DVD can only played with DVD players or certain Blu-ray players on TV or computer, but nowdays, most people are favor of enjoying movies on smartphone or tablets when they are out of home or office. Fortunately, there are many great DVD Ripper software out there can assist you to rip and convert DVD movies to digital file formats for playing on portable devices. In the following article, we has picked two of the highly recommended DVD Ripper software – Pavtube DVDAid and Winx DVD Ripper for you. We will compare the two program for you with detailed comparison parameters. Pavtube DVDAid is the combo function of DVD Ripper and DVD Copy. Unlike many free DVD Ripper software, the program can powerfully bypass up to 14 types of DVD protection including region code, RCE, key2Audio, UOP, CSS, Macrovision, Disney X-project DRM (99 titles DVD encryption included), FluxDVD, Protect, ARccOS, AACS, BD+, ROM Mark, BD-Live, etc. With the program, you can not only make a full disc or main movie copy of DVD disc but also rip or convert DVD to any of your desired file formats or devices and programs preset profile formats. The built-in video editor allows you to trim away unwanted footage, crop video, add watermarks and edit subtitles and the profile customization function enables you to adjust the technical aspects of videos, such as codecs, aspect ratios, bit-rates, frame rates and more. Winx DVD Ripper is capable of ripping any DVD and even the strongly encrypted DVD disc and ISO image file to various main stream file formats such as AVI, WMV, MP4, MOV, MKV, FLV, H.264, MEPG, M2TS, etc and also preset profile formats for iPhone, iPad, Apple TV, Samsung, HTC, Kindle, Nexus, Windows phone, Surface, Xbox, Sony, Chromecast, etc. The program offer 4 different copy modes including 1:1 clone full DVD disc to ISO image and DVD folder or copy main/full title content of DVD to MPEG2 file with lossless video quality and 5.1 Channel AC3/DTS Dolby audio. 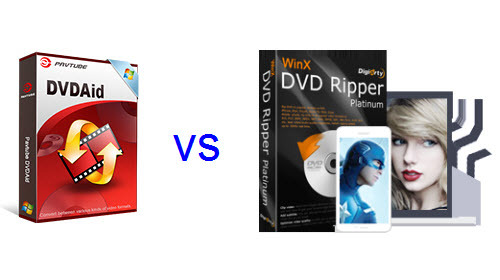 From above comparison charts, we can see that both Pavtube DVDAid and Winx DVD Ripper Ultimate are excellent in removing DVD copy and region protection, in addition, both the two program offers rich DVD copy mode, various popular file formats and device preset profile formats output options, DVD subtitle function and output profile customization function. While in the video editing function aspects, Pavtube DVDAid offers more editing functions than Winx DVD Ripper, you can not only use the program to trim, merge and crop, but also split, deinterlace video, add watermark, apply special rendering effect, change picture effect, flip & rotate video and remove/replace audio in video.